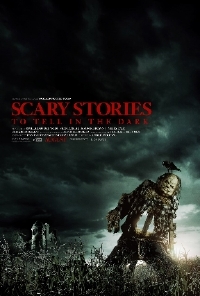 Scary Stories comes with a lot of nostalgia for me. When I was growing up, I was obsessed with taking it out of my school library and looked at the pictures all the time. I never thought one day they would turn it into a movie and here we are. It is co-written by Daniel Hageman & Kevin Hageman, Guillermo del Toro. It’s l968 in America. Change is blowing in the wind...but seemingly far removed from the unrest in the cities is the small town of Mill Valley where for generations, the shadow of the Bellows family has loomed large.